**Movie received for review, all thoughts are my own. 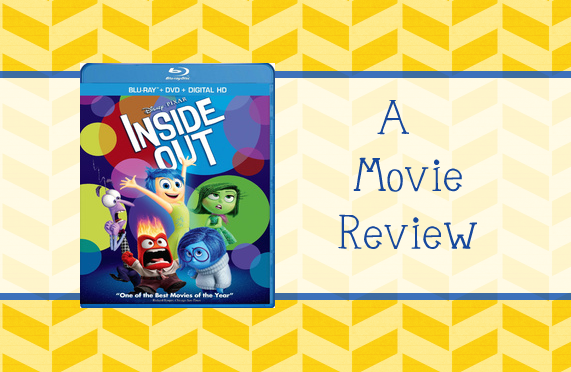 From the moment we saw the first previews for Inside Out, my kids and I could not wait to see it! For my son, it just looked like a fun movie with characters to love. But for myself, I saw a much greater potential. Having a child with autism, we have had to teach my son many things that to most of us come naturally- things like emotions. These are things that most children pick up on their own naturally, but something that many on the spectrum struggle with. My son included. He is a fairly concrete thinker and has a harder time understanding concepts like emotions than understanding those things that he can touch and see. I saw this movie as a great way to give a visual to those kids that like my son needed a little extra help, and while by its release, he'd already learned his emotions fairly well, the characters have on many occasions provided a great talking point to help me relate to him in a way that makes sense to him! Needless to say, I went into the theater with high hopes... and Inside Out did not disappoint! Talk about emotions- Inside Out hit on all of them! But for my kids, it was mostly Joy! They adored it! My not even 2-years-old at the time immediately fell in love with Bing Bong and immediately started going around singing his song everywhere she went! My son thought Anger was hilarious and could be found quoting his lines over again too! From the moment we left the theater, we were counting down the days until we could bring it home! And that time has come! Inside Out is available to purchase NOW. Do you ever look at someone and wonder what's going on inside their head? Disney-Pixar's Inside Out takes an exciting and hilarious journey into the mind to find the answer. Based in Headquarters, the control center of 11-year-old Riley's mind (Kaitlyn Davis), five emotions are hard at work, led by lighthearted optimist Joy (Amy Poehler). She strives to make sure Riley stays happy as she operates alongside fellow emotions Fear (Bill Hader), Anger (Lewis Black), Disgust (Mindy Kaling) and Sadness (Phyllis Smith). We love Pixar shorts here! I loved that Riley's first date gave us some more time with the characters we'd fallen in love with. And while Lava was not my personal favorite, my son had fallen in love with it at the theater, so he loved being able to watch it again! This was particularly interesting for my son. He has an interest in animation, so it was neat to see the process and just how much work actually goes into making an animated film. I also personally found it interesting to see the progress from the initial story idea to what we see in the film and just how in depth the research and design was! It actually made me appreciate the film all that much more. From the film to the special features, we loved it all! I highly recommend picking up your copy today! Omgosh this was our favorite movie!! Seriously an instant classic and even educational!! I can picture using the character and premises for so many emotions lessons!! So perfect!! We just saw it this weekend on redbox! When I say we I mean my husband and son watched while I cooked. Bummer cause I really wanted to see it. I did love the parts I saw, however. Was great reading about this movie helping your son some.